Scotland landed the Aintree Grand National 12 months ago with One For Arthur and they look to have another leading chance of making it back-to-back wins – this time with a horse called SEEYOUATMIDNIGHT. Seeyouatmidnight, who is around the 16/1 mark in the Grand National betting market, heads into Saturday’s Merseyside Marathon in tip-top shape and will now run in the colours of Cheveley Park Stud’s David and Patricia Thompson after the horse was purchased just days before the big race. The National often throws up a story of some sort – so could this be this year’s one? 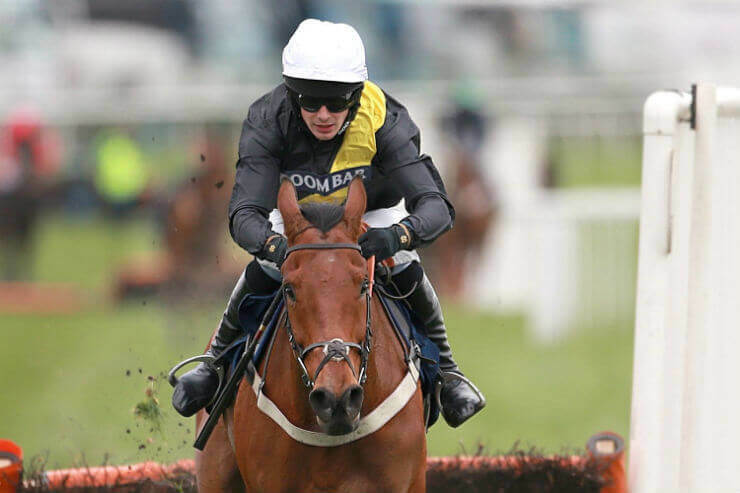 Trained by Sandy Thomson-trained ten-year-old will be looking to replicate year’s winner One For Arthur, who was the first Scottish-trained winner of the Grand National since Rubstic in 1979. Plus, Seeyouatmidnight will now also be strongly linked with the 1992 Grand National winner – Party Politics who was also bought just days before that race by – you guessed it – the Thompsons’ silks having been purchased just days beforehand. Seeyouatmidnight ridden by Ryan Mania during the Doom Bar Sefton Novices’ Hurdle during Ladies Day of the Crabbie’s Grand National 2014 Festival at Aintree Racecourse, Liverpool. PRESS ASSOCIATION Photo. Picture date: Friday April 4, 2014. See PA story RACING Aintree. Photo credit should read: David Davies/PA Wire found at The Daily Record. Brian Hughes will ride the 10 year-old and knows the horse well. He’s ridden him 10 times before, winning on him on four occasions. “It’s very easy to see why he’s at the forefront of the market,” said Thomson on Monday. “He’s got a nice racing weight, and if he’d run this season in some of the nice races we would have hoped he wouldn’t be rated 149 any more. His third in the Scottish National [in 2016] shows he stays. Hopefully he’ll take to the fences and jump as well. “I’ve no concern about the ground. He beat Bristol De Mai on good ground [at Carlisle in October 2016] and he’s won a bit on soft ground, so I’m not concerned about that. Thomson and big-race jockey Brian Hughes together have decided not to give Seeyouatmidnight a go over a replica National fence, meaning he will encounter the unique obstacles for the first time on Saturday. 12 months ago Le Mercurey, who finished 12th, plus Just A Par (14th) and Highland Lodge (pulled up) also ran in the Thompson’s colours.